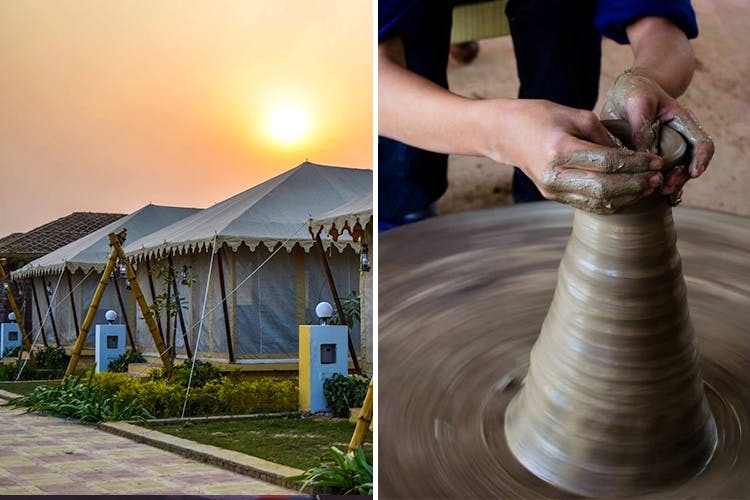 The Rurban Village near Ghaziabad tries to combine the best of both rural activities (think pottery, mud bath and more) and urban comforts (glamping in Swiss tents). For when you need to take a break but can’t get too far away from the city, this resort is the perfect weekend getaway. The Rurban Village is a massive resort created with the intention of introducing a bit of the simple, rural life to us city-drained souls. So, you’d expect to find all the forgotten joys of the villages like pottery, doodh bilona, mud cottages, tubewell baths and animal feeding at this resort. To ensure that there’s plenty to keep everyone occupied and happy, they’ve even got popular activities like zorbing, zip-lining, All Terrain Vehicle (ATV) tracks and paddle boating. While you can always drop by for a day trip with the fam and give all these fun activities a shot (there’s archery too! ), guests have the option to camp overnight in their luxurious glamping (glamorous camping) tents as well. You can opt for the air-conditioned Swiss tent houses that come with an LED TV, an attached bath, private patio and more facilities. However, if we were you, we’d book the Royal Eco Mud Cottages. These cottages look a lot like a village hut (on the outside) with a thatched rooftop but are more spacious and promise open access to the sky jacuzzi. Breakfast, lunch and dinner is taken care of if you plan on staying overnight, but you can even avail the meal options for your day trips. They’ve got fresh, home-style meals on the menu and honestly, there’s nothing better than a hearty stuffed paratha meal with white butter after a round of wall-climbing and family cricket. Not a paratha fan? There’s Rajma, Puri Aloo, Kadhi Chawal, Paneer Sabzi and desserts too. Their day trip packages start at INR 750 (for school kids) that include breakfast, lunch and snacks along with all activities except Urban Adventure Activities (zorbing, ATV, zip-lining etc.). Their corporate and family packages start at INR 1,400. Only bummer? A minimum of 10 people need to avail this package. But it also means, the more, the merrier. Time to catch up with your big fat college gang, then? For exact charges, check out their website here.